The mizubake (Japanese water brush) is a Japanese brush made for painting water onto large surfaces, different from brushes that use paint. 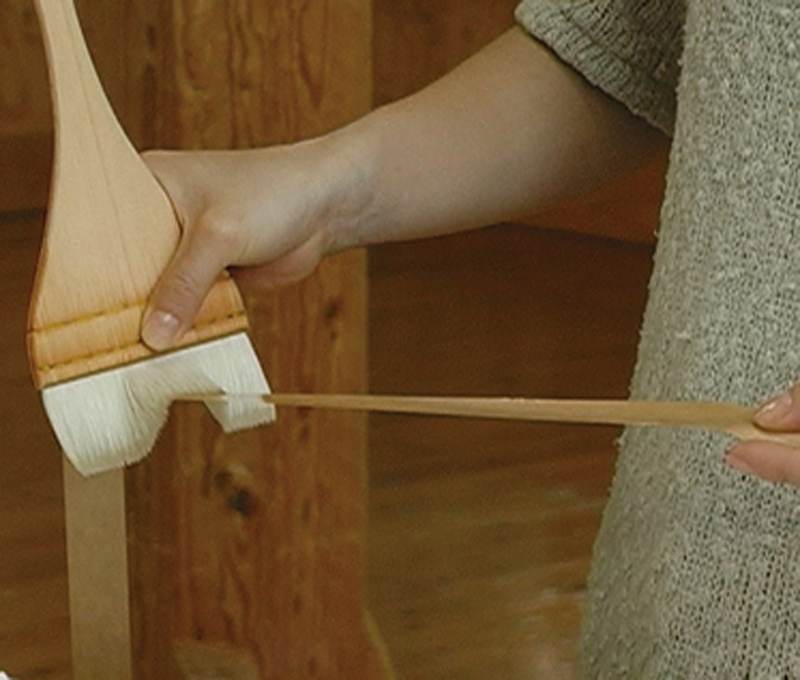 The mizubake is chiefly used in stretching, in water-based paintings (watercolors and Japanese paintings), and in dampening procedures on block-print papers. As they are used chiefly in the stretching procedure, mizubake are soft, made from pure wool, and have good water overtones, patterned sections made from white wood, and a brush width ranging from approximately 2 sun (6 cm) to 6 sun (18 cm). Using the mizubake, you apply moisture or clean water to the paper to prevent the paper from becoming contaminated. 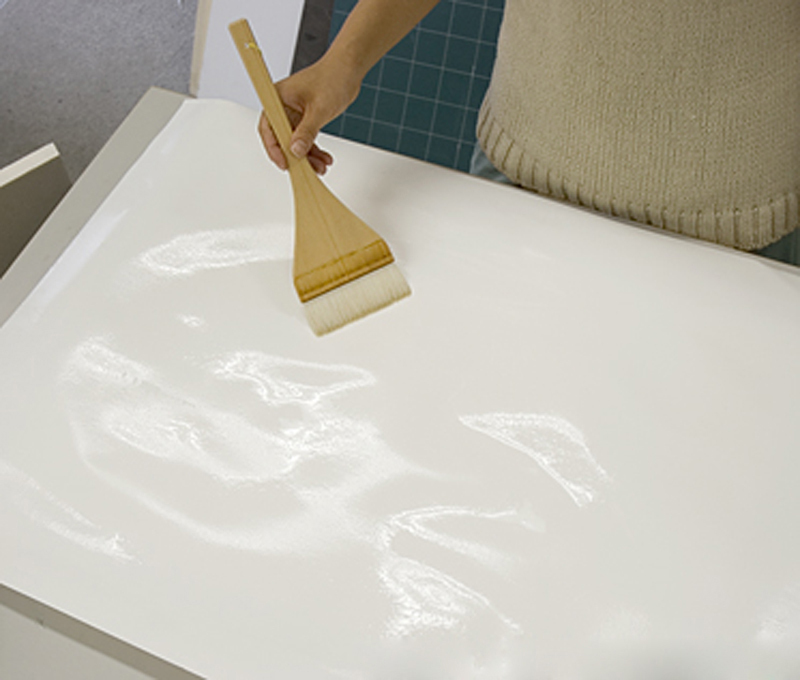 By painting vertically and horizontally after applying water diagonally on the rear side of the paper, the moisture pervades the entire paper evenly. If water puddles form, you may remove the water with the mizubake after squeezing out excess water from the brush. You may also use the mizubake whenever a stretching tape adherent becomes damp. Mizubake are also effective in using water to produce “feathering” (obscuring) expressions when creating watercolors and Japanese paintings. When you first apply the paint and proceed to “feather” the painting with water, however, the paint may get on the mizubake; it is thus probably best to use a regular paintbrush (ebake). In addition to these applications, artists also use special mizubake to moisten paper when burnishing block prints and also for the linings and frames of Japanese painting and calligraphy. These mizubake have a certain thickness to their hair tufts, short patterns, and brush widths that are over 5 sun (roughly 15 cm). 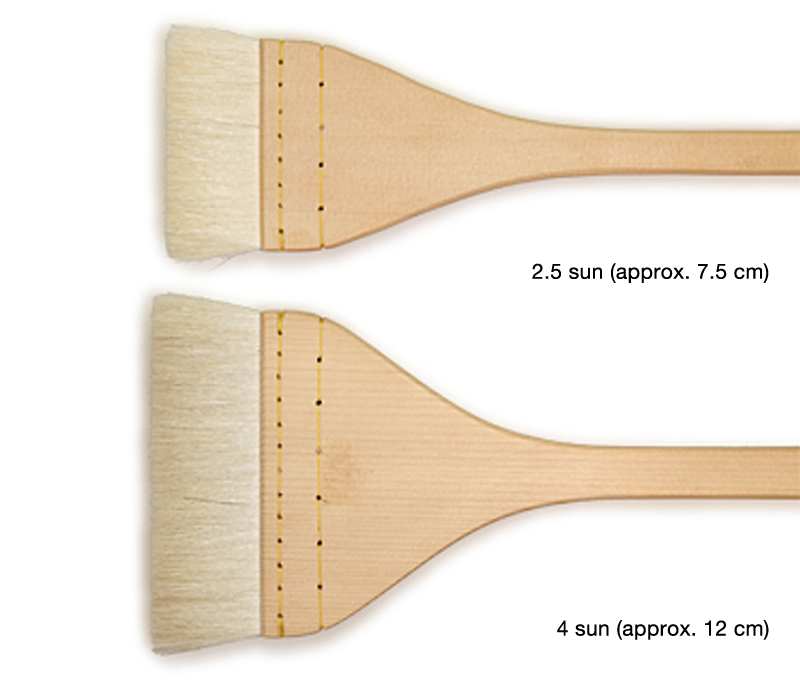 The types of brush hairs in block print-use brushes are made of pure wool; frame-use brushes, meanwhile, have brush hairs made of deer summer fur. You can remove the extra water from the binding-use (hyōsō) mizubake by shaking it repeatedly after soaking the hair ends once in water. After that, use the brush so that only the hair ends touch the paper. Be sure to apply only a small amount of moisture to the paper. In addition to the mizubake, there are three other types of hake brushes in Japanese paintings: the sizing brush (dōsabake), the painting brush (ebake), and the Chinese brush (karabake). 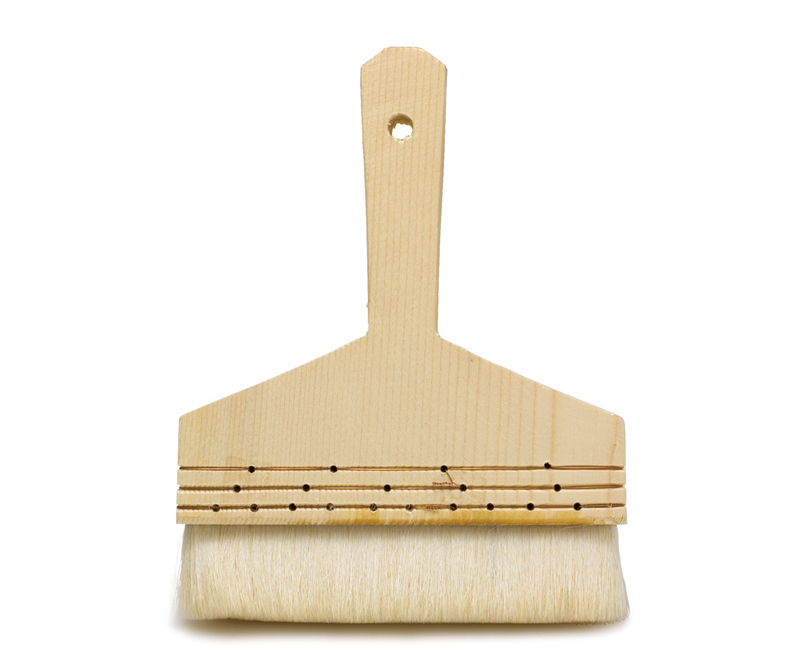 Because the hairs of these brushes come into contact with different ingredients and paints, it is necessary to use them discriminatingly so that they do not mix. The mizubake is used only in clean water that has not been contaminated by paint. 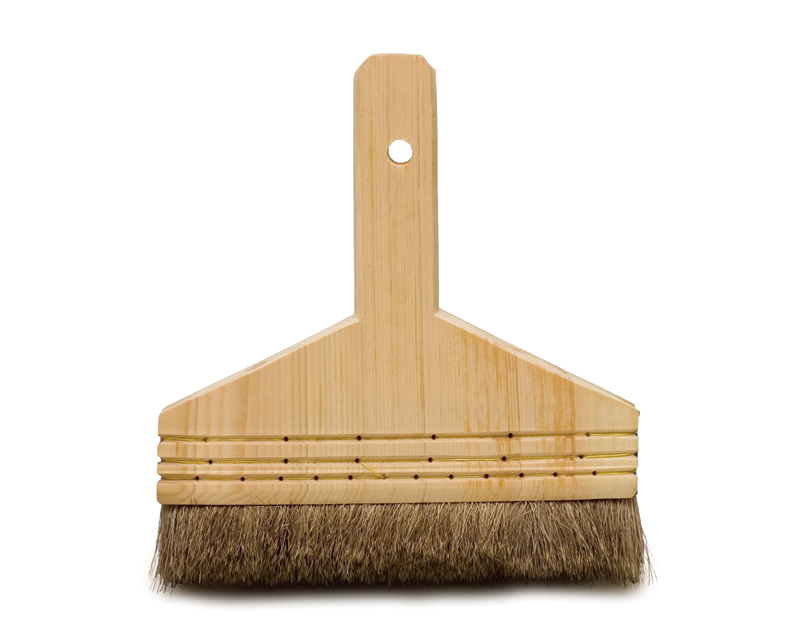 After using the brush, remove the excess moisture and hang it out to dry in a well-ventilated place that is not exposed to direct sunlight. Mizubake that are used in stretching, block prints, and so forth are available for purchase at general art supply stores. Mizubake for framing use are available for purchase at framing stores.